The proximity of the famous Keystone studios to the Echo Park Film Center inspired me to select a historical program of short experimental films from the Netherlands. 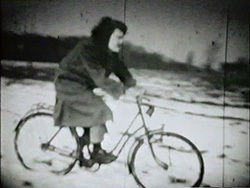 The rough physical action and gags typical of the early Keystone films may have inspired some of the Dutch filmmakers. Their biting absurdism is often used as a critical tool towards small mindedness and false moralism. Wim van der Linden, 16mm, color, 1966, 3 min. 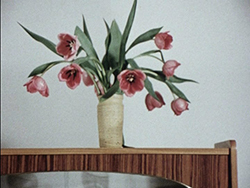 Part one of a series of ‘Sad movies’: A shot of a vase with tulips in a Dutch middle class interior. Dramatic music suggests something big is going to happen. Expectations are shattered, although? The film plays with the concept of national identity and beauty. The result is comical but also provocative. 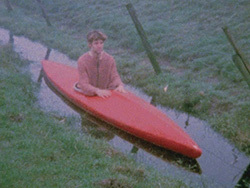 Paul de Nooijer, 16mm, color, 1981, 3 min. We see a father and his son, both well dressed, each sitting on a table with a cake in front of them. They challenge each other, not by throwing the cake, but actually moving their face very close to their cake. Again music helps to build suspense. When we finally get what we want, the tension immediately collapses. 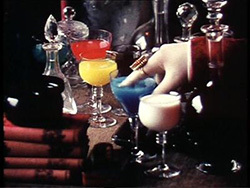 Henri Plaat, 16mm, color, 1972, 6 min. A Cardinal in his private study seems to be busy with serious religious matters. His actions get more and more absurd, and become increasingly surrounded by symbols of death and decay. His authority over matters of life and death seems to lose all its power. Paul de Mol, 16mm, B&W 1969, 6 min. A man roams around in the Dutch countryside, he rides his bicycle, falls, continues walking, bleeding, apparently losing his way and his purpose. His clumsy behaviour initially makes us laugh, but soon we stop laughing and start feeling uncomfortable while observing his senseless behaviour. Frederieke Jochems, 16mm, color, 1989, 10 min. A woman appears to be cleaning a winding staircase with a vacuum cleaner. Halfway a pendulum clock is attached to the wall. 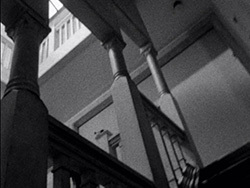 A man enters and starts climbing the stairs. The camera changes point of view; from woman, to man, to pendulum, to vacuum cleaner. Space, time and human relationship are getting increasingly distorted. Frans Zwartjes, 16mm, color, 1971, 15 min. A man and a woman roaming through an empty house. The man is holding a camera with a superwide lens, pointing it towards himself and the woman (his wife?). Both are wearing heavy make-up, making them look like actors from a different era. They turn around each other, sometimes elegant, sometimes plump. The whole scene evokes a sense of voyeurism, with love and aggression entangling in a strange way. 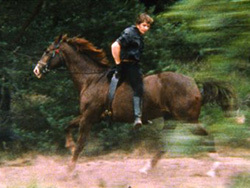 Paul de Nooijer, 16mm, color, 1981, 4 min. A family gathered together in a living room, wearing and carrying attributes connected to Dutch country life and holidays. They start moving round the table, looking towards the camera. The movement is sped up, faster and faster they go round. The crazier and funnier it gets, the more deadpan they look into the camera, unmoved by their own crazy actions. 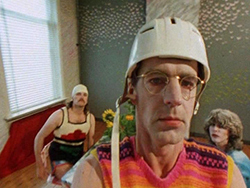 Jeroen Eisinga, 16mm, color, 1993, 4 min. In a ditch in the Dutch countryside we see a young man sitting in a canoe. The ditch is so small that he can not go backwards or forwards. He looks a bit around, seemingly uninterested with his surroundings and untouched by his precarious position. We as audience seem to be the ones that are lost. Erik Wesselo, 16mm, color, 1997, 4 min. A man riding his horse in a backward position. The scene is set in a foresty landscape. This difficult physical action is not given any purpose other then the wish to overcome the difficulty itself. The performance which has been captured on film can be seen as an analogy to the creation of art; without purpose but essential for the quality of our lives as human beings.